How is your vegetables garden looking this month? May is one of the most important for vegetable gardening as well as the most hectic months in Louisiana. 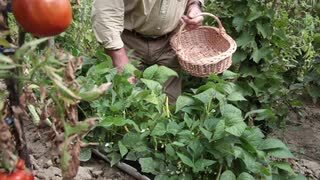 This time of year we are harvesting vegetables, pulling out lingering cole crops and planting new transplants into the garden. If you planted your early spring vegetables at the appropriate time, then you should be harvesting bell peppers, tomatoes, snap beans and squash this time of year. Other vegetables that should be coming into harvest include cucumbers, sweet corn and Irish potatoes. Be sure to harvest bell peppers when they have reached full size. Harvest colored bell peppers at the green stage. Leaving them on the plant until they turn their end color will increase the probability of fruit rot on the plant. A good rule of thumb is it should only take a quarter turn or twist of the bell pepper to harvest. If the pepper needs to be twisted a full rotation on the plant, then it is safe to assume the pepper is not ready. Tomatoes can be harvested at the breaker stage. The breaker stage is when the tomato on the vine turns from green to pink. The tomato doesn't have to be fully ripened or red to be harvested. Harvesting tomatoes before the breakers stage will result in tomatoes which stay green. These tomatoes will never ripen or turn red like they should. If you have any winter vegetables in the garden, go ahead and pull those out now. These crops will not produce in the heat of the summer, and it's time to plant new crops. Vegetable transplants that can be added to the garden in May include eggplants, hot peppers, Southern peas and sweet potatoes. May also is an important month in vegetable gardening because the heat is starting to intensify. As temperatures and humidity increases, more diseases and insects tend to put pressure on the vegetable garden. Be sure to walk your garden and scout for insects and discolored foliage. Look for beetles, caterpillar holes in leaves and yellowing or browning spots on the leaves. Each blemish on the leaf gives us a clue as to what may be causing it. The most important thing when combating pests in the garden is to be sure to properly identify them first. Also, be on the lookout for the squash vine borer. This is a highly destructive insect that affects squash and pumpkins planted in summer. Apply Sevin or Bt to the vines every couple of days to prevent this insect from killing your squash and pumpkins.